Liverpool FC has today announced the launch of the club’s first full-time coaching programme in Cyprus. Together with partner Gymnastikos Syllogos Pancypria (GSP), the Reds will deliver ongoing player development programmes and soccer schools to youngsters in the country, as well as recruiting and training local coaches. The project, which will kick off with programmes at the GSP Stadium and Sports Centre in Nicosia, will officially start this summer and will provide a unique opportunity for youngsters to learn to play The Liverpool Way. From the start of next season, weekly coaching throughout the age groups will be on offer for young players. The programme will provide those aged four to 17 with the opportunity to improve their football skills and develop in the technical, tactical, physical, mental and social aspects of the game through age-specific coaching sessions. Through the unique methods of Liverpool FC, there will also be a focus on developing players both on and off the pitch, with emphasis placed on improving key life skills of the participants, such as communication, teamwork and leadership. Liverpool FC and GSP will also train coaches in Cyprus and provide career opportunities to help develop the game locally. LFC will send coaches out to Cyprus throughout the year to work on the project. 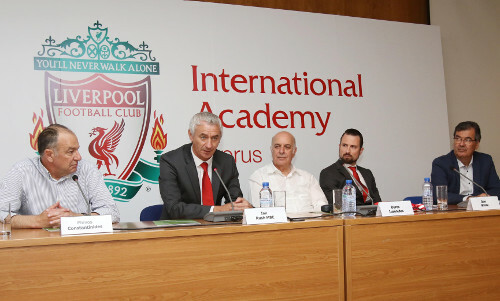 LFC ambassador Ian Rush said: “Our International Academies are a great way to bring this fantastic club of ours to the people. This project will provide many opportunities for young players in Cyprus to improve their skills and be developed via our unique coaching system. Players will get a coaching experience in Cyprus that follows the LFC Academy curriculum and will give them every chance to develop both on and off the pitch. Doros M Ioannides, chairman of GSP, added, “We are delighted to be bringing Liverpool FC to Cyprus. We believe that this is the best training programme available and will be of huge benefit to our young players and coaches alike. “GSP have been delivering a track and field athletics academy program for years and we are confident that this will add to our scope of providing the youth of Cyprus with high-quality sport programs. There is a natural fit in terms of The Liverpool Way, the values of the club and also what we are aiming to achieve here in providing the ultimate football education for the players.